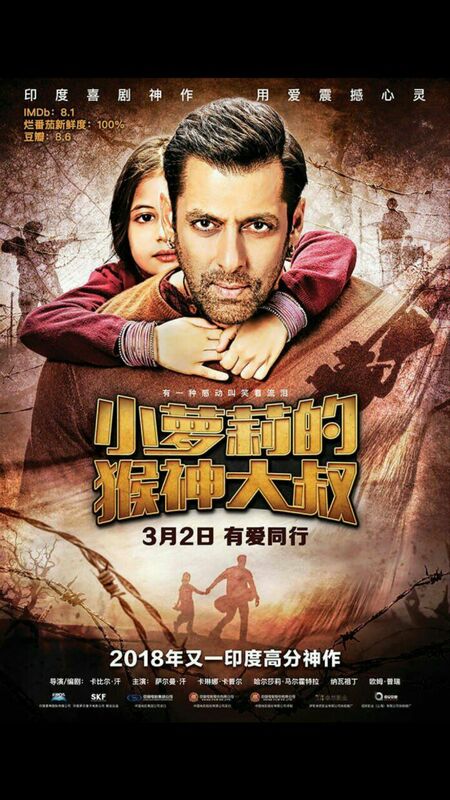 Bajrangi Bhaijaan had a fabulous opening weekend in China and was a hit with audiences giving the film very positive reviews. Despite releasing more than two years after its worldwide release in 2015 and lesser number of shows compared to other big Indian releases in China the film has earned over 55.2 crore ($8.45 million) in the first 3 days. The Indian drama directed by Kabir Khan stard Salman Khan as Bajrangi, an ardent devotee of Hindu deity Hanuman, and his arduous journey to reunite a six-year-old Pakistani girl – who somehow gets lost in India – with her parents, back to her hometown in Pakistan. The film also stars Kareena Kapoor and Nawazuddin Siddiqui. On day 1, March 2nd, which also was during the Chinese lantern festival, the film earned $2.24 million on 17000 shows. Day 2 the take increased to $ 3.07 million at 19000 shows and then Day 3 the film was showcased across 21446 shows and earned $ 3.14 million. So the total so far is $8.45 million.